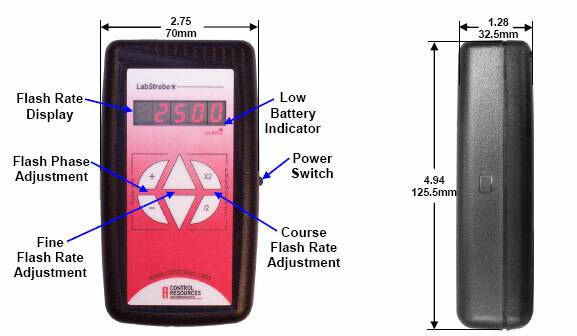 Reference Mark: When measuring the RPM of a rotating device, place or select a unique mark on the device to use as a visual reference. Correcting for Reference Mark Illusions: A flash rate of ½ or ¼ of the true RPM will yield one reference mark image. To eliminate this type of error, adjust the fine or course flash rate keys to get two clear reference mark images 180° apart. Then press the “/2” key once and use fine adjustments to hold the single reference mark still. Flash Phase Adjustments: When measuring the speed of a rotating device that is partially blocked from view so that only an arc is visible, one can shift a reference mark into view by using the Phase Adjustment keys.